I've made many patchwork hearts over the years. I happen to LOVE the color red and I LOVE hearts so it seems inevitable that the results would be quilted valentines. If you are in the mood to start stitching for your Valentine or you just want to pin a few more ideas to your Pinterest board, here are some of my favorites! 1. Valentine Trio. Get the free pattern here. 2. Sew a heart block found here. 3. Dreaming in red and white found here. 4. Read about the saga of this quilt here. 5. Or make this in time for Valentine's day! 6.Have less time, here's a mug rug that only take minutes! Share your favorite Valentine projects in the comments. 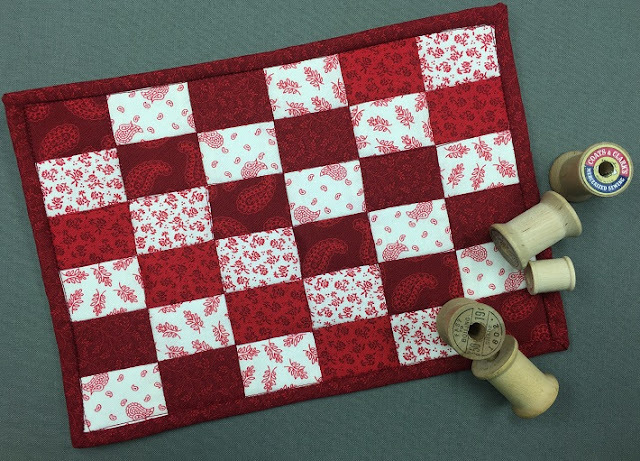 I would LOVE to see what you're stitching for your LOVE this Valentine's Day! I have so much red batik fabric leftover from my schoolhouses, I know another red and white quilt is in my future somewhere! Thanks for the inspiration! My valentine has more quilted things than he knows what to do with so I am working on other fun projects! Your book arrived yesterday and I absolutely love it! The only problem I am having is trying to decide which one to make first! Thanks again! !